With Scribblenauts being one of our favorite games of 2009, it is no surprise we were excited to get some hands on time with its sequel at San Diego Comic Con this year. In the E3 Trailer for Super Scribblenauts, we found out that not only would the game receive a control upgrade where players would be able to finally control Maxwell with the D-Pad instead of the sometimes unreliable stylus but they would also be given the option of using adjectives in creating their objects. These adjectives would influence the color, behavior and abilities of the items created in Super Scribblenauts. In the first game if a player wanted to create a flying pig, they’d have to type “Pig” and then “Wings” and attach the wings to the pig. Now, by simply typing “flying pig”, the game intuitively combines the two into one hovering swine. At the Con, we got a walkthrough of some of the game’s levels. 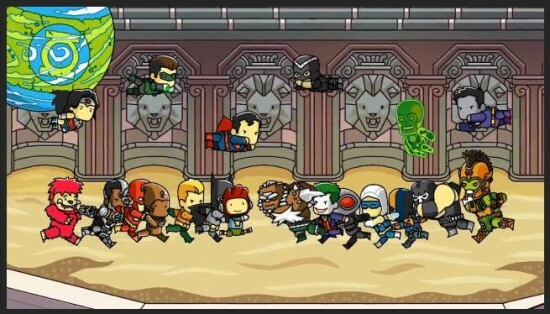 Super Scribblenauts will feature 120 new levels which Warner Bros. Interactive Entertainment described as “deeper, more linear and require a little more thought process”. With the upgraded controls also comes more action oriented levels. While many levels are still focused on problem solving, there are now stronger action elements to the title. The classic stylus controls are still there but for “twitch” style action levels, the d-pad with the ability to control when Maxwell jumps greatly improves upon what most consider the only flaw of the original game. While Maxwell isn’t going to be as tight control-wise as Mario would be, he is much easier to properly maneuver, saving accidental deaths and aggravating level failures. At last year’s E3, we were treated to several previews of 5th Cell’s action adventure puzzle game known as Scribblenauts, a DS game whose objective was to solve puzzles and finish levels by summoning nouns. The game turned out to be a critical success, with incredibly fun gameplay that offered endless possibilities. So it’s no surprise that, at this year’s E3, the trailer for the game’s follow-up, Super Scribblenauts, has emerged. With Super Scribblenauts, players will be able to not only summon nouns like the previous game, but will be able to add on adjectives to those nouns, resulting in even more creative and endlessly possible ways to solve the game’s puzzles. Some hilarious examples you’ll see in the trailer are “winged armed angry cow”, “zombified telekinetic bully”, and “gentlemanly red raptor”. The trailer also mentions that the game will include refined controls, allowing players to move Max with both the stylus and the control pad, something that was a huge problem in the original game. Super Scribblenauts will also n even more expansive dictionary of words that the game will recognize. Be sure to arm yourself with both stylus and dictionary this October when Super Scribblenauts is released for the Nintendo DS. You can watch the trailer after the jump. Ever since we heard about Scribblenauts at E3 and then finally got our hands on it at San Diego Comic-Con, there has been no handheld game more anticipated by any member of The Flickcast. Scribblenauts is without a doubt one of the most innovative and ambitious puzzle games to come out for any video game system. Recently, it was reported that someone had hacked the game’s ROM and found out that it featured over twenty thousand unique words in its database of objects that players could write and create during game play. Because of this, the combination of solutions are virtually infinite, only limited by the creativity of the player. Like our hands on time at Comic-Con, having the full retail game in front of us has been nothing short of an addiction. Even turning off the Nintendo DS to type this review was a challenge. With 12 stages featuring 11 action challenges and 11 puzzle challenges, Scribblenauts offers a daunting amount of gameplay. But because of the game’s incredibly innovative format, time streaks by. Challenges range in difficulty from 1 to 4 stars with early stages staying in the lower ranges. At Comic-Con, we at The Flickcast got to take a look at more than just comic books. We also got to check out some of the big video game releases coming out in the coming months. On the top of that list was Scribblenauts. Well with Scribblenauts, you are not given a limited set of basic tools to work with. The unique aspect of Scribblenauts is how it allows the player to type in any object they want (excluding proper nouns, like someone’s Maxwell or a trademarked property like Micky Mouse) and put it to use in the game.